Who doesn’t love to host a celebration in their own home? The problem is if you have a very small living space, exactly how are you going to pull this off? It’s not as tricky as you think to throw a party in an apartment or small house. All you need is a few creative tips like the ones below. Make the most of your space: Use all the rooms in your apartment. Rearrange the furniture as best you can so that there is room for people to mingle and maybe even dance if they want to. The easiest way to create space even in the smallest room is to push furniture to the edges of the room. Clean up the clutter so your guests have plenty of room to move around. String up some mood lighting so they know they’re permitted in your bedroom. Create a slightly different vibe in each area, so your guests can mix and mingle. Don’t skimp on the seating: Seating arrangements can be tricky in a small living space. You probably only have a sofa and perhaps one other chair. Adding extra chairs is not practical if you’re already limited on space. If you’re hosting a casual party and you’re short on places for people sit learn about Fombag. This giant-sized bean bag is a comfortable space saver and can seat two or three people at once. Set up a snack bar: If you don’t have a separate dining area, put out some finger foods on your kitchen counters or breakfast bar, that way you can keep this as the main area for grabbing a bite to eat. Have everything prepared and served for when your guests arrive. You don’t want to be cooking during your party. Use disposable plates, plastic knives, forks and spoons and plastic cups then you won’t have to worry about not having enough to go round. You also won’t have to deal with lots of dirty dishes in the morning. Mix-n-match the music: You can’t have a party without music. Make sure everyone gets to hear something they enjoy by pumping out the sounds from an app like Spotify. This will give you a wide range of tunes to choose from and let your guests select their own tracks if they want to. Pack some party punch: Guests are usually more than happy to BYOB, but this can take up space and result in a bunch of half-empty bottles and cans scattered all over the place, which are accidents waiting to happen. Talk to your guests beforehand about chipping in to make a few signature drinks at the beginning of the evening. Filling a punch bowl or pitchers can cut down on the waste and you can serve drinks easily in small, convenient measures. Put out a few Sharpies and encourage guests to label their drinks to avoid using too many cups. If you are having cans and bottles, fill your sink with ice and use it as a cooler. Get your game on: Party games are always fun, but if you’re short on room, a board game like Monopoly is impractical. Stick to virtual games that you can all play together on your cell phones. There are plenty of them out there if you know where to look. Keep it cool: It’s going to get hot in there is you have a lot of people in a small space. The best thing to do to maintain an ambient temperature is to turn on the air conditioning an hour before your guests are due to arrive; a little sooner if you have been using the oven all day to prepare party snacks. 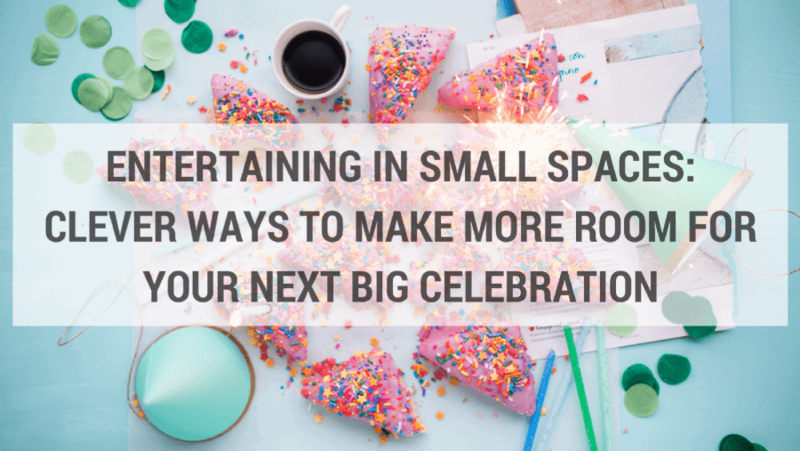 You don’t have to be deterred from throwing a party just because you live in a small apartment. If you repurpose your space creatively, everyone will still have a great time without even noticing the size of your home. This is a featured post from Mia Dawson. Mia Dawson takes an interest in home DIY and decor projects and loves entertaining at home whether hosting a 5 course dinner party or having close friends around for wine and a chat.